Just a reminder to those who have not yet filed their 2014 tax return that April 15, 2015 is the due date to either file your return and pay any taxes owed, or file for the automatic six-month extension and pay the tax you estimate to be due. Tax year 2014 balance-due payments – Taxpayers that are filing extensions are cautioned that the filing extension is an extension to file, NOT an extension to pay a balance due. Late payment penalties and interest will be assessed on any balance due, even for returns on extension. Taxpayers anticipating a balance due will need to estimate this amount and include their payment with the extension request. Tax year 2014 contributions to a Roth or traditional IRA – April 15 is the last day contributions for 2014 can be made to either a Roth or traditional IRA, even if an extension is filed. Individual estimated tax payments for the first quarter of 2015 – Taxpayers, especially those who have filed for an extension, are cautioned that the first installment of the 2015 estimated taxes are due on April 15. If you are on extension and anticipate a refund, all or a portion of the refund can be allocated to this quarter’s payment on the final return when it is filed at a later date. If the refund won’t be enough to fully cover the April 15 installment, you may need to make a payment with the April 15 voucher. Please call this office for any questions. Individual refund claims for tax year 2011 – The regular three-year statute of limitations expires on April 15 for the 2011 tax return. Thus, no refund will be granted for a 2011 original or amended return that is filed after April 15. Caution: The statute does not apply to balances due for unfiled 2011 returns. If this office is holding up the completion of your returns because of missing information, please forward that information as quickly as possible in order to meet the April 15 deadline. Keep in mind that the last week of tax season is very hectic, and your returns may not be completed if you wait until the last minute. If it is apparent that the information will not be available in time for the April 15 deadline, then let the office know right away so that an extension request, and 2015 estimated tax vouchers if needed, may be prepared. Whether or not the interest you pay on a loan to acquire a vehicle is deductible for tax purposes depends how the vehicle is being used (for business or personal purposes), the tax form on which the expenses are being deducted, and the type of loan. If the vehicle is being used partially for business and the expenses are being deducted on your self-employed business schedule, then the business portion of the interest will be deductible as business interest, but the personal portion will not. If the vehicle is being used partially for business as an employee and the expenses are being deducted as an itemized deduction, then neither the business portion nor the personal portion of the interest will be deductible. If the vehicle is entirely for personal use, then none of the interest will be deductible, because the only interest that is still deductible as an itemized deduction is home mortgage interest and investment interest. As an alternative to a nondeductible consumer loan, you might consider acquiring that vehicle with a home equity line of credit. Generally, current law allows individual taxpayers to borrow up to $100,000 of home equity and deduct the interest on that loan as home mortgage interest. This would also apply to the purchase of a vehicle or motor home. Using a home equity line will generally make the interest deductible. Treat the home equity loan like a consumer loan and pay it off over the same period of time you would have had to pay the consumer loan. Otherwise, you may reach retirement age without having the home paid for. When buying a car, you can sometimes get very favorable interest rates or a rebate. To determine which is best, compare the difference in total loan payments over the life of the loans to the rebate amount. It is also good practice to make sure the benefit of making the interest deductible is greater by using the home equity line of credit than the benefit of the low interest consumer loan or the rebate. If there is any chance of defaulting on the loan, the repercussions from defaulting on a home loan are far more serious than on consumer debt. If you need assistance in deciding on a course of action, please call our office. https://tarlow.com/wp-content/uploads/2016/05/logo.png 0 0 louadmin https://tarlow.com/wp-content/uploads/2016/05/logo.png louadmin2015-04-06 17:16:512015-04-06 17:16:51Will the Interest on Your Vehicle Loan be Deductible? Business owners – especially those operating small businesses – may be helped by a tax law allowing them to deduct up to $5,000 of the start-up expenses in the first year of the business’s operation. This is in lieu of amortizing the expenses over 180 months (15 years). Generally, start-up expenses include all expenses incurred to investigate the formation or acquisition of a business or to engage in a for-profit activity in anticipation of that activity becoming an active business. To be eligible for the election, an expense must also be one that would be deductible if it were incurred after the business actually began. An example of a start-up expense is the cost of analyzing the potential market for a new product. As with most tax benefits, there is always a catch. Congress put a cap on the amount of start-up expenses that can be claimed as a deduction under this special election. Here’s how to determine the deduction: If the expenses are $50,000 or less, you can elect to deduct up to $5,000 in the first year, plus you can amortize the balance over 180 months. If the expenses are more than $50,000, then the $5,000 first-year write-off is reduced dollar-for-dollar for every dollar in start-up expenses that exceed $50,000. For example, if start-up costs were $54,000, the first-year write-off would be limited to $1,000 ($5,000 – ($54,000 – $50,000)). The election to deduct start-up costs is made by claiming the deduction on the return for the year in which the active trade or business begins, and the return must be filed by the extended due date. Travel and other related costs to secure prospective customers, distributors, and suppliers. For the purchase of an active trade or business, only investigative costs incurred while conducting a general search for or preliminary investigation of the business (i.e., costs that help the taxpayer decide whether to purchase a new business and which one to purchase) are qualified start-up costs. Costs incurred attempting to buy a specific business are capital expenses that aren’t treated as start-up costs. If you have a question related to start-up expenses, please give this office a call. Clients are usually pleasantly surprised by the answer—that special rules apply to figuring the tax on the sale of any inherited property. Instead of having to start with the decedent’s original purchase price to determine gain or loss, the law allows taxpayers to use the value at the date of the decedent’s death as a starting point (sometimes an alternate date is chosen). This often means that the selling price and the inherited basis of the property are practically identical, and there is little, if any, gain to report. In fact, the computation frequently results in a loss, particularly when it comes to real property on which large selling expenses (realtor commissions, etc.) must be paid. This also highlights the importance of having a certified appraisal of the home to establish the home’s tax basis. If an estate tax return or probate is required, a certified appraisal will be completed as part of those processes. If not, one must be obtained to establish the basis. It is generally not acceptable just to refer to a real estate agent’s estimation of value or comparable sale prices if the IRS questions the date of death value. The few hundred dollars it may cost for a certified appraisal will be worth it if the IRS asks for proof of the basis. Another issue is whether a loss on an inherited home is deductible. Normally, losses on the sale of personal use property such as one’s home are not deductible. However, unless the beneficiary is living in the home, the home becomes investment property in the hands of the beneficiary, and a loss is deductible but subject to a $3,000 ($1,500 if married and filing separately) per year limitation for all capital losses with any unused losses carried forward to a future year. In some cases, courts have allowed deductions for losses on an inherited home if the beneficiary also lives in the home. In order to deduct such a loss, a beneficiary must try to sell or rent the property immediately following the decedent’s death. In one case, where a beneficiary was also living in the house with the decedent at the time of death, loss on a sale was still deductible, when the heir moved out of the home within a “reasonable time” and immediately attempted to sell or rent it. This treatment could change in the future, however. The President’s Fiscal Year 2016 Budget Proposal includes a proposal that would eliminate any step up in basis at the time of death and would require payment of capital gains tax on the increase in the value of the home at the time it is inherited. If you have questions related to inheritances or home sales, please give this office a call. (iii) that is recorded, where permitted, or is otherwise perfected in accordance with applicable state law. In other words, the home is put up as collateral to protect the interest of the lender. Thus, interest paid on undocumented loans, or documented but unsecured notes, is not deductible by the borrower but is fully taxable to the lending individual. The IRS is always skeptical of family transactions. Don’t get trapped in this type of situation. Take the time to have a note drawn up and recorded or perfected in accordance with state law. If you have questions related to this situation or other issues related to the deductibility of home mortgage interest, please give this office a call. A business deduction is allowed for lodging when a taxpayer travels away from his or her “tax home.” A taxpayer’s tax home is generally the location (such as a city or metropolitan area) of a taxpayer’s main place of business (not necessarily the place where he/she lives). The traveling away from his or her tax home condition creates problems for individuals attending conferences and training sessions within their tax homes that include extended-hour events that preclude traveling back home between the days of the events. (1) The lodging is necessary for the individual to participate fully in or be available for a bona fide business meeting, conference, training activity, or other business function. (2) The lodging is for a period that does not exceed five calendar days and does not recur more frequently than once per calendar quarter. (3) If the individual is an employee, his or her employer requires him or her to remain at the activity or function overnight. (4) The lodging is not lavish or extravagant under the circumstances and does not provide any significant element of personal pleasure, recreation, or benefit. Example: A business conducts business-related sales training sessions at a hotel and conference center near its main office. The employer requires both its field and in-house sales force to attend the training and stay at the hotel overnight for the bona fide purpose of facilitating the training. If the company pays the lodging costs directly to the hotel, the stay is a working condition fringe benefit to all attendees (even to employees who live in the area who are not on travel status) and the company may deduct the cost as an ordinary and necessary business expense. If the employees pay for the lodging costs and are reimbursed by the company, the reimbursement is of the accountable plan variety and is tax-free to the employees and deductible by the company as an ordinary and necessary business expense. Example: If Warren, a locally based, self-employed consultant, were required by a company to attend the sessions and stay at the hotel, he could deduct the expense if he paid for it himself or exclude the expense if he were reimbursed by the company after accounting for it in full for his costs. Substantiation requirements – Generally lodging expenses are deductible only if they are substantiated in full (record of time, place, amount, and business purpose, plus paid bills or receipts). The expenses can’t be substantiated using the lodging component of the federal per-diem rate. If you have questions about the deduction and substantiation of business-related lodging expenses, please give this office a call. Selling a property one has owned for a long period of time will frequently result in a large capital gain, and reporting all of the gain in one year will generally expose the gain to higher than normal capital gains rates and subject the gain to the 3.8% surtax on net investment income added by Obamacare. Capital gains rates: Long-term capital gains can be taxed at 0%, 15%, or 20% depending upon the taxpayer’s regular tax bracket for the year. At the low end, if your regular tax bracket is 15% or less, the capital gains rate is zero. If your regular tax bracket is 25% to 35%, then the top capital gains rate is 15%. However, if your regular tax bracket is 39.6%, the capital gains rate is 20%. As you can see, larger gains push the taxpayer into higher capital gains rates. $200,000 for taxpayers filing as single or head of household. $250,000 for married taxpayers filing jointly or as a surviving spouse. This is where an installment sale could fend off these additional taxes by spreading the income over multiple years. Here is how it works. If you sell your property for a reasonable down payment and carry the note on the property yourself, you only pay income taxes on the portion of the down payment (and any other principal payments received in the year of sale) that represents taxable gain. You can then collect interest on the note balance at rates near what a bank charges. For a sale to qualify as an installment sale, at least one payment must be received after the year in which the sale occurs. Installment sales are most frequently used when the property that is sold is real estate, and cannot be used to report the sale of publicly traded stock or securities. Example: You own a lot for which you originally paid $10,000. You paid it off some time ago, leaving you with no outstanding mortgage on the lot. You sell the property for $300,000 with 20% down and carry a $240,000 first trust deed at 3% interest using the installment sale method. No additional payment is received in the year of sale. The sales costs are $9,000. Of your $60,000 down payment, $9,000 went to pay the selling costs, leaving you with $51,000 cash. The 20% down payment is 93.67% taxable, making $56,202 ($60,000 x .9367) taxable the first year. The amount of principal received and reported each subsequent year will be based upon the terms of the installment agreement. In addition, the interest payments on the note are taxable and also subject to the investment surtax. Thus in the example, by using the installment method the income for the year was reduced by $224,798 ($281,000 – $56,202). How that helps the taxpayer’s overall tax liability depends on the taxpayer’s other income and circumstances. Here are some additional considerations when contemplating an installment sale. Existing mortgages – If the property you are considering selling is currently mortgaged, that mortgage would need to be paid off during the sale. Even if you do not have the financial resources available to pay off the existing loan, there might be ways to work out an installment sale by taking a secondary lending position or wrapping the existing loan into the new loan. Tying up your funds – Tying up your funds into a mortgage may not fit your long-term financial plans, even though you might receive a higher return on your investment and potentially avoid a higher tax rate and the net investment income surtax. Shorter periods can be obtained by establishing a note due date that is shorter than the amortization period. For example, the note may be amortized over 30 years, which produces a lower payment for the buyer but becomes due and payable in 5 years. However, a large lump sum payment at the end of the 5 years could cause the higher tax rate and surtax to apply to the seller in that year – so close attention needs to be paid to the tax consequences when structuring the installment agreement. Early payoff of the note – The buyer of your property may decide to pay off the installment note early or sell the property, in which case your installment plan would be defeated and the balance of the taxable portion would be taxable in the year the note is paid off early or the property is sold, unless the new buyer assumes the note. Tax law changes – Income from an installment sale is taxable under the laws in effect when the installment payments are received. If the tax laws are changed, the tax on the installment income could increase or decrease. Based on recent history, it would probably increase. Installment sales do not always work in all situations. To determine whether an installment sale will fit your particular needs and set of circumstances, please contact this office for assistance. To start creating them, open the Lists menu and select Item List. Click the down arrow on the Item menu in the lower left, then click New. Since you will be selling similar items that you’ll be keeping in stock, selectInventory Part under TYPE. 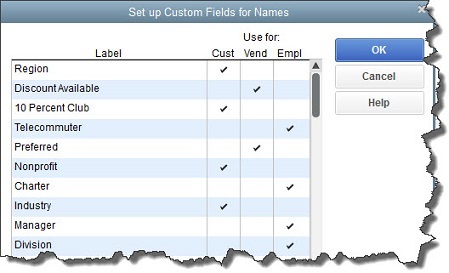 Then click on the Custom Fields button over on the right and then Define Fields. As you did with the earlier custom fields, enter a word or phrase under Label and then click in the Usecolumn. After you’ve entered up to five fields, click OK.